BANGKOK, April 18 – About 60,000 foreign tourists, almost half Chinese, entered Thailand through major airports nationwide during the Thai New Year Songkran festival April 12-16, according to the Association of Thai Travel Agents (ATTA). ATTA executive Thongyoo Suphavittayakorn said China requested landing permission for 427 additional flight arrivals, including 19 chartered services, mainly at Suvarnabhumi Airport. He said a large number of Chinese tourists will arrive Thailand during the Golden Week – a one-week holiday from May Day in China. 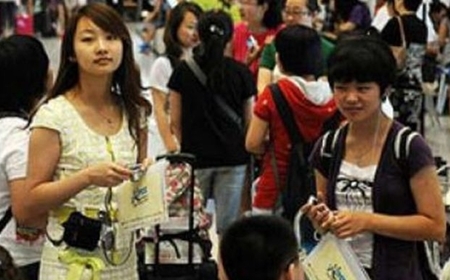 Chinese tourists spend an average of Bt3,500-4,000 per person during their stays in Thailand. ATTA forecasts an increase in the number of Chinese tourists to Thailand this year from 2.5 million to three million while the total number of tourists should also rise from 22 million last year to at least 25 million this year. The government’s targeted revenue from tourism at Bt2 trillion in 2015 is achievable, he said. Russian tourists formed the second largest group to Thailand during the Songkran festival, followed by those from India, Taiwan and Japan.